The gut tracts of many animals are inhabited by a microbial community composed of bacteria, archaea, fungi, and viruses. The interplay among these inhabitants can have an impact on health and disease. Mosquitoes are no exception – replication of dengue virus in the gut tract is modulated by a fungus and a bacterium. When female mosquitoes take a blood meal from a viremic host, both blood and virus travel to the gut. The viruses may replicate in the epithelial cells lining the gut, and then pass through these cells and spread systemically. Viruses that reach the salivary gland can then be transmitted when the mosquito takes another blood meal. For more information on this process, watch my video on how mosquitos transmit diseases. One of the many viruses transmitted by bites of Aedes aegyptii mosquitoes is dengue virus, which causes over 100 million cases each year of dengue fever. A specific fungus that inhabits the A. aegyptii gut, of the species Talaromyces, makes this mosquito better able to support dengue virus infection (link to paper). Proteins secreted by the fungus appear to reduce levels of digestive enzymes which would otherwise inactivate the virus. Bacteria in the mosquito gut can also influence dengue virus replication (link to paper). Mosquitoes that are fed antibiotics to remove gut bacteria produce ten-fold less dengue virus after oral infection. Of the 21 cultivatable bacteria recovered from the mosquito gut, only one, Serratia marcescens, could restore viral replication to levels observed in untreated mosquitoes. 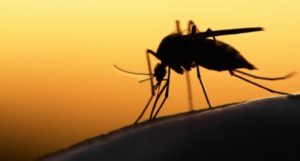 A protein secreted by S. marcescens, a peptidase called SmEnhancin, was identified that renders mosquitoes more susceptible to dengue virus infection. S. marcescens lacking the SmEnhancin gene failed to enhance dengue virus replication in the mosquito gut. The targets of SmEnhancin are membrane-bound mucins – heavily glycosylated proteins found in epithelial tissues. The mucins protect the epithelial cells from virus infection; their removal by SmEnhancin provides virus better access to cells and therefore improves infection. Many bacterial species secrete Enhancin-like proteins, but among Bacillus, Enterobacter, Enterococcus, Klebsiella, and Serratia species, only those from the latter facilitate dengue virus replication in the mosquito gut. These experiments were done with a laboratory strain of A. aegyptii. Among field caught mosquitoes, some harbor S. marcescens, and these mosquitoes produce more dengue virus after oral feeding than do those lacking the bacteria. Introduction of S. marscens into mosquitoes that lack the bacteria improves viral yields. It seems likely that dengue prevalence in Aedes aegyptii could be modulated in the field by S. marcescens in the gut tract. While these observations are convincing, they leave me with several questions. Surely S. marcescens does not inhabit the mosquito gut for the benefit of viruses. 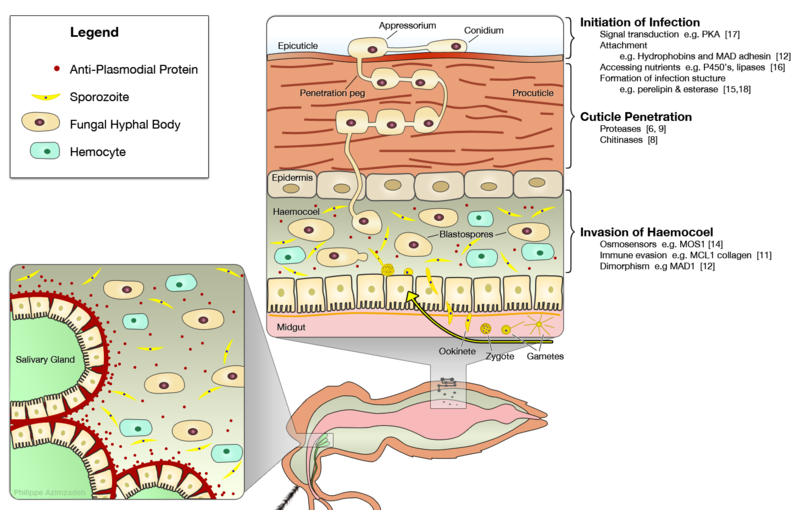 What does SmEnhancin digestion of the mucin coat on the gut epithelium provide to the mosquito? Such removal must be limited and controlled, otherwise damage would result. That not all mosquitoes harbor S. marcescens suggests that the bacterium is not essential for survival. The authors note that Enhancins are produced by many bacteria that inhabit the mammalian gut tract. I wonder if these might modulate infection of enteric viruses, much as SmEnhancins do in the mosquito gut. Prof. Raymond St. Leger from the University of Maryland showed that fungi that naturally infect mosquitoes can be made to express single chain antibodies and various toxins in the heamocoel of mosquitos, where fungal hyphal bodies are in the same topological space as malaria sporozoites, in order to block malarial transmission without putting selective pressure on mosquitoes themselves.